Theories of the Policy Process provides a forum for the experts in the most established and widely used theoretical frameworks in policy process research to present the basic propositions, empirical evidence, latest updates, and the promising future research opportunities of each framework. This well-regarded volume covers such enduring classics as Multiple Streams (Zahariadis et al. ), Punctuated Equilibrium (Jones et al. ), Advocacy Coalition Framework (Jenkins-Smith et al. ), Institutional Analysis and Development Framework (Schlager and Cox), and Policy Diffusion (Berry and Berry), as well as two newer theories—Policy Feedback (Mettler and SoRelle) and Narrative Policy Framework (McBeth et al.). The fourth edition now includes a discussion of global and comparative perspectives in each theoretical chapter and a brand-new chapter that explores how these theories have been adapted for, and employed in, non-American and non-Western contexts. An expanded introduction and revised conclusion fully examines and contextualizes the history, trajectories and functions of public policy research. 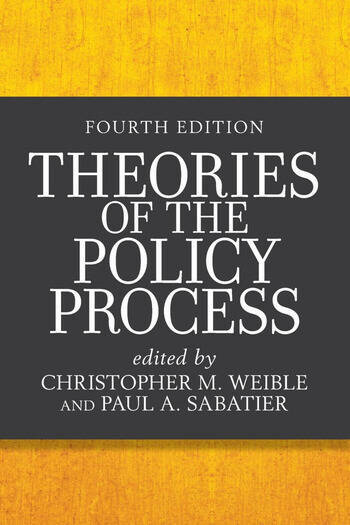 Since its first publication in 1999, Theories of the Policy Process has been, and remains, the quintessential gateway to the field of policy process research for students, scholars and practitioners. Christopher M. Weible is professor at the School of Public Affairs at the University of Colorado Denver. He is co-editor of Policy Debates in Hydraulic Fracking (2016). Paul A. Sabatier was political scientist and professor of environmental studies at the University of California, Davis.